First described by Miller in 1776, this beautiful parrot is, and always has been found only in Saint Lucia. It is predominantly green in colour, and a typical specimen has a cobalt blue forehead merging through turquoise to green on the cheeks and a scarlet breast. There are no visible differences between the two sexes. Mating for life and maturing after five years, these long-lived birds are cavity nesters, laying two to three white eggs in the hollow of a large tree during the onset of the dry season between February and April. Incubation commences on the appearance of the second egg and lasts 27 days. The young fledge leave the nest 67 days after hatching. Saint Lucia Parrots are birds of the forest canopy. Despite their large size and bright plumage these are difficult to detect among the dense foliage as they clamber about in search of fruits, nuts, seeds and berries from a wide variety of trees including Gommier, Chatagnier, Bois Pain Maron and Aralie. In former times this bird was not as rare as it is today. In 1902 Lady Thompson described it as "not uncommon in the high woods of Saint Lucia." Whilst in 1928 Bond wrote this Parrot, "Occurs in some numbers in the mountains of Saint Lucia from La Sorciere, south along the backbone ridge." In the intervening years a combination of hunting, habitat destruction and the illegal bird trade resulted in a rapid decline in its numbers and in the mid 1970’s our parrot faced extinction. Commenting on the hunting of this species, Lady Thompson (1902) wrote, "Unfortunately dead birds may be found almost every week in the market of the little town of Soufriere, and they are eaten as a delicacy by both black and white Creoles." In 1968 Wingate wrote that "as many as forty parrots are probably shot each year in an attempt to catch them alive for sale." Jovicich (1976) adds, "fourteen of fifteen parrots which are shot in this manner die." Deforestation, however, remains the most serious threat faced by the Saint Lucia Parrot. Charles (1982) estimates that the nation’s forest is being cleared at "2% a year," leaving land barren and useless, our rivers silted and the parrot and other forest wildlife without a home. 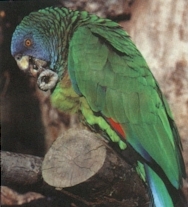 Jovicich (1976) writes, "Saint Lucia’s remaining Amazona versicolor population of 150 +/- 25 is fast approaching extinction in the wild … it is certain that it will not escape oblivion." In 1978 the Forestry Division of the Ministry of Agriculture launched a campaign to save this species from extinction. In 1979 the Saint Lucia Parrot was declared the island’s National Bird and in 1980 wildlife legislation was revised. Today the parrot, and most other forms of wildlife are absolutely protected year round and anyone found hunting, keeping or trying to trade in these birds is liable to a fine of $5000 or 1 year in jail. Forestry laws were also revised to protect watersheds as well as wildlife habitats, and illegal clearing of forest are punishable by fines of $2000. During the last decade protected areas have been set aside and educational programmes initiated. These are having the desired effect. By 1988 the Saint Lucia Parrot was slowly increasing in numbers and today its population stands at about 250. It may be seen flying across the forests of Quilesse, Millet and Edmund symbolic of the island’s beauty and uniqueness. In 1982 the first ever successful captive breeding of the Saint Lucia Parrot occurred at Jersey in the UK, and in 1989 two young were returned to Saint Lucia and ca be seen at Union Mini Zoo. Saint Lucia’s National Bird remains an endangered species and still needs your help.